Breaking Views: GWPF Newsletter: Will Solar Cycle In 200 Years Put The Brakes On Warming? GWPF Newsletter: Will Solar Cycle In 200 Years Put The Brakes On Warming? 1) Will Quietest Solar Cycle In 200 Years Put The Brakes On Warming? 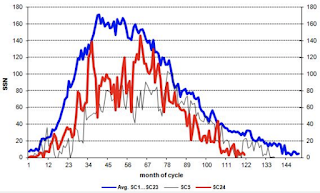 Solar Cycle 24 has had the lowest solar activity since the Dalton Minimum around 1810. Our sun was also very sub-normally active in December last year. 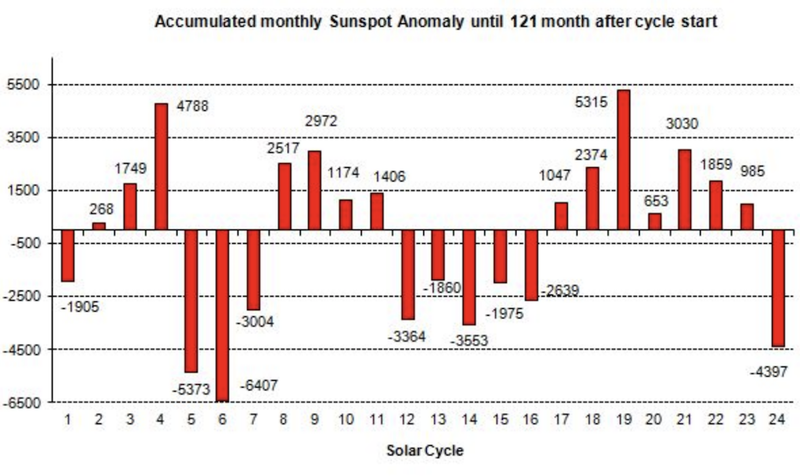 We are writing the 121st month since the beginning of cycle number 24, in December 2008, and since 2012 (when we started the blog here) we could only reformulate the opening sentence once: In September 2017 when the sun was 13% more active than the long-term (since 1755) average. All other months were below average. 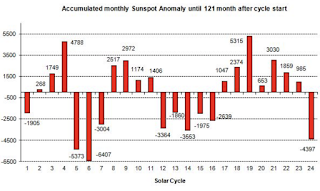 With the sunspot number (SSN) of 3.1 for the monthly average for December and a total of 24 days without any spot (throughout the second half of the month the sun was spotless) we are in the middle of the cycle minimum. Fig. 1: Solar Cycle 24 – red – is almost over. Since October 2017 (cycle month 108) we have been at the minimum and the next cycle should start at the beginning of 2020. The blue curve is the respective monthly average over the 23 cycles completed so far. The black curve (for comparison) SC 5, which was recorded around 1815 and was as similarly weak as the current cycle. Fig. 2: The sunspot activity of our sun since cycle 1 (1755). The numbers are calculated by adding the monthly differences with respect to the mean (blue in Fig.1) up to the current cycle month 121. Clearly SC 24 is the lowest activity since the Dalton Minimum (SC 5,6,7) around 1810 when using the entire cycle and not only the maximum activity in short peaks (see Fig. 1). A “polar vortex” event is breaking record-low temperature readings across the Great Plains and Midwest, and many in the media are rushing to blame the deep freeze on global warming. The New York Times, for example, filled the top of its website with coverage of the Midwest’s polar plunge, including one prominent article that claims record heat in Australia and record cold in the U.S. were two sides of the global warming coin. The Chicago Times, Axios, The Washington Post and others echoed the theory that global warming was weakening the jet stream, allowing the “polar vortex” to meander south and bring record cold. Many experts don’t think this is correct and say it’s media climate-hype. 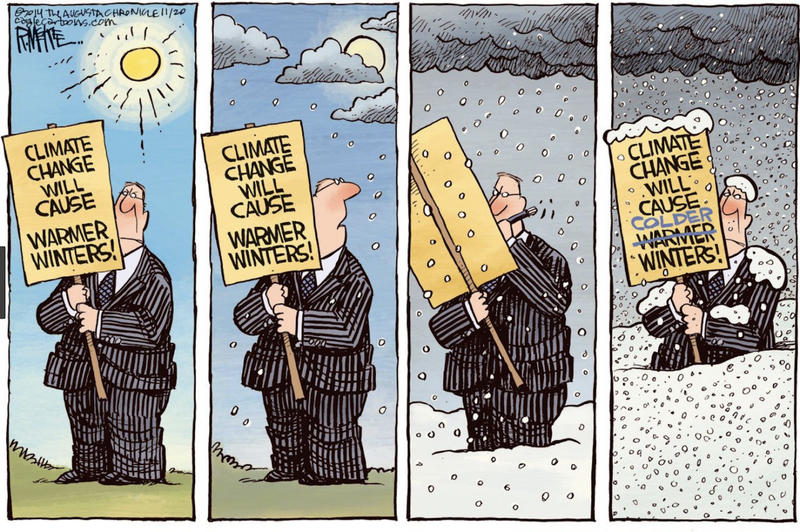 In fact, weather events that used to be considered, well, weather are now attributed to global warming that’s supposed to play out over decades and measured in trends, not short-term weather variability. “‘Climate change’ once referred to outcomes measured via statistics (‘detection’) tracked over decades,” University of Colorado professor Roger Pielke Jr. noted Wednesday on Twitter. 29, 2019. REUTERS/Pinar Istek. Make sense? Of course it doesn’t, and many scientists have pointed it out. “Frankly, it is a stretch to make that link,” Kevin Trenberth, a climate scientist at the National Center for Atmospheric Research, told The Daily Caller News Foundation on Tuesday. Britain’s Court of Appeal has rejected a lawsuit by a group of climate activists to have their case heard. A UK citizens’ lawsuit over the government’s 2050 climate target hit “the end of the road” this week after an appeals court refused to hear the case, the climate legal group Plan B announced. Plan B and 11 Brits lodged the case in December 2017, seeking to compel business, energy and industrial strategy secretary Greg Clark to raise the country’s target for cutting emissions by mid-century. That’s now the end of the road for the latest climate law case. European lawmakers are locked in a dispute over a landmark climate plan that is meant to drag the EU into compliance with the Paris Agreement, as parliamentary committees tussle over who should take the lead. When the European Commission unveiled its climate strategy for 2050 in November, it was generally accepted that the Parliament’s environment committee (ENVI) would pen a resolution effectively setting out the EU assembly’s position. Although non-binding, Parliament resolutions still carry a fair amount of clout, particularly near the beginning and end of EU legislative cycles. But the process has become convoluted by the energy committee (ITRE), chaired by Polish MEP Jerzy Buzek (EPP), which disputed the state-of-play with support from the transport committee. Economists, of all people, should understand the power of specialisation. They are taught early that prosperity is founded on the division of labour: individuals becoming more productive in specific tasks. Yet when dispensing policy advice, they seem to ignore that lesson, presuming that they know better than politicians about good politics. Economists frequently claim that their preferred ideas are “both good economics and good politics”. When you next read that phrase from a practitioner of the dismal science, be suspicious. For on climate change alone, economists seemingly have duff political instincts. The economists’ platform for dealing with carbon emissions is clear: get rid of expensive regulations and give up trying to tilt the energy market towards specific technologies. These create damaging inefficiencies hidden in higher bills. Instead, apply a simple carbon tax to price in the external costs of global warming, and allow markets to efficiently adapt. If one desires carbon mitigation, and presuming one can overcome rent-seeking to deliver the deregulation, such a policy is commendable. Pricing externalities would deliver carbon reductions at the lowest overall economic cost. But this ignores a major obstacle: a carbon tax appears politically toxic. In the US, the public of the state of Washington (one of the most liberal in the country) handsomely rejected such a tax in November 2018. It would have been introduced at $15 (£11.35) per US ton of emissions, and climbed by $2 a year until emission levels were reduced to 25 per cent below the level seen in 1990. The revenue would have been used for feel-good environmental projects related to clean air, water, and health. Yet it suffered a heavy defeat – 56.3 per cent of voters opposed the measure. This is just one of many examples of the US public’s unwillingness to price carbon. Democrats, remember, felt politically unable to pass legislation to that effect under President Barack Obama, even when controlling all levers of government. The public overwhelmingly believes that climate change is real and supports the idea of a carbon tax in the abstract. Yet almost 70 per cent say that they would oppose a measure adding $10 to their monthly energy bills, while 40 per cent would oppose a mere $1 monthly uplift. It’s not just America. The recent protests in France were triggered by President Emmanuel Macron’s proposed fuel tax hike – predicated on reducing carbon emissions. The French President wanted to lead by example. Given that France has a relatively low carbon economy because of its large nuclear sector, emissions from vehicles were the next obvious target. In early December, though, with Paris burning, Macron felt compelled to cancel the hikes planned for 2019. In truth, some economists acknowledge these political difficulties. But they then advocate wheezes too clever by half to offset them. In Australia, the Labor government under Julia Gillard tried to counteract the uplift in bills with increased welfare payments and cuts to income tax. But that proved no match for the opposition highlighting the direct impact on electricity and fuel bills. That political lesson should be heeded as the latest plan, endorsed by Nobel Prize winning economists, hits the mainstream. 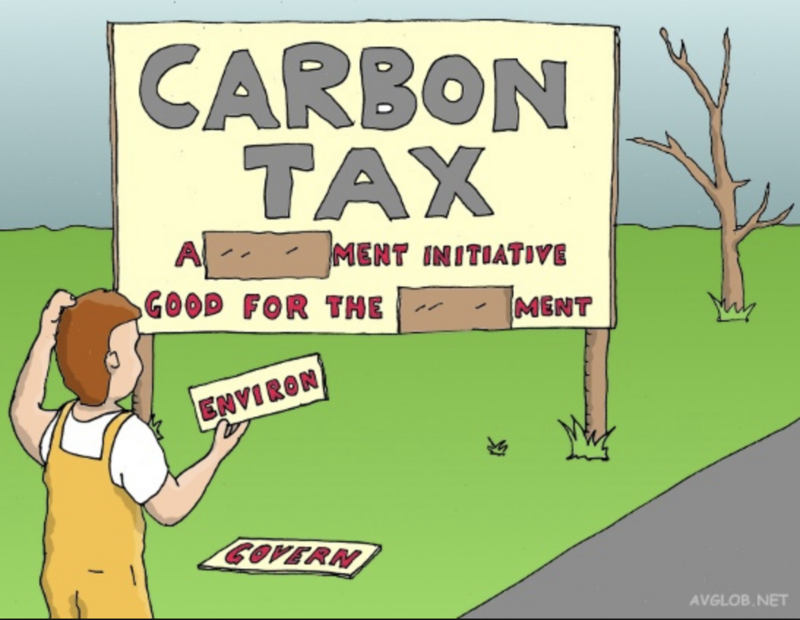 In a statement in the Wall Street Journal, a host of big-beast economists proposed a package that would see a US carbon tax (at $40 per ton) introduced as a quid-pro-quo for eliminating all existing carbon-related regulations. To counteract the effects on living standards, revenues from the tax would be redistributed to citizens as an annual dividend – like a universal basic income payment to all Americans. Again, in theory, this is preferable to using regulations to reduce emissions. And if passed, similar plans would likely be adopted around the world. Yet there are strong indications that such a scheme is dead on public arrival. An Associated Press poll found that 66 per cent of Americans would oppose a plan that traded off carbon taxes for a less regulated energy sector. Moreover, under half favoured a planned tax if revenues were used to fund rebates or dividends. In fact, that poll suggested that a carbon tax would only win public support if revenues were used for environmental projects and research – a stated preference that itself failed to translate to a revealed one in the Washington vote. On climate policy, then, good politics and good theoretical economics do not appear to coincide. Perhaps that’s a failure of economists’ own arguments, or of the public’s economic knowledge. Or maybe there’s a simpler truth. As damaging as expensive hidden mitigation policies might be, perhaps politicians simply know better what they can get away with. Dumb environmental policies are routine across Europe—see Emmanuel Macron’s riot-inducing fuel tax in France—but even by that standard Germany’s new plan to abandon coal is notable. Having wasted uncountable billions of euros on renewables and inflicted some of Europe’s highest energy prices on German households and businesses, now Berlin is promising to kill the one reliable power source Germany has left. That plan comes via a blue-ribbon commission that recommended over the weekend that Germany phase out coal-fired power generation by 2038. Coal currently accounts for 40% of Germany’s electricity, by far the highest proportion in northern Europe. To the extent this is creating an environmental crisis, it’s a result of more than a decade of bad green policy choices. 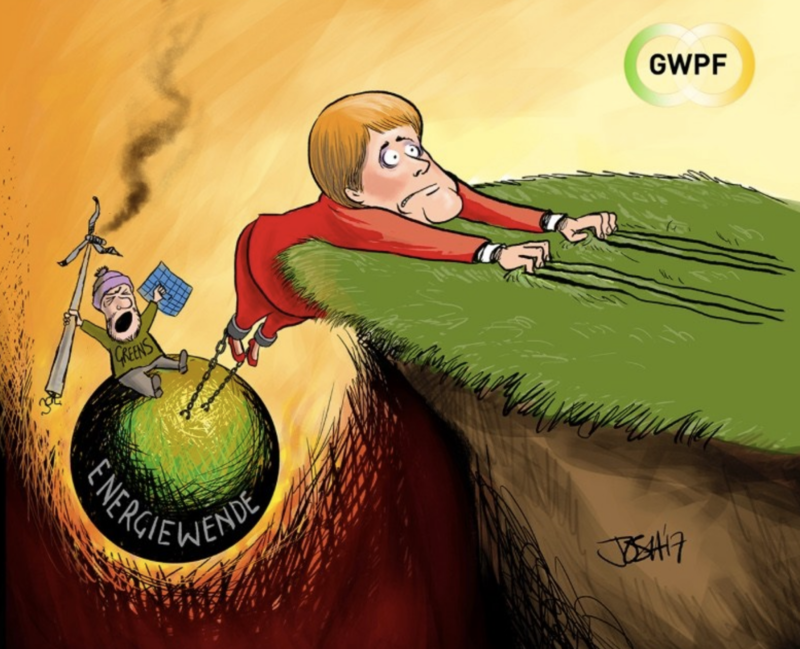 The Energiewende, or energy transformation, championed by Chancellor Angela Merkel heavily subsidizes unreliable wind and solar power, making it uneconomical for utilities to invest in cleaner natural gas. Meanwhile, Mrs. Merkel pledged to shutter German nuclear plants in the wake of Japan’s 2011 Fukushima disaster. Utilities have fallen back on cheaper but dirtier coal to fill the supply gaps when the wind doesn’t blow or the sun isn’t shining. Not that a new coal ban will help much. Critics such as Karen Pittel of the Ifo think tank in Munich note that Germany is likely to import coal-fired electricity from Poland and the Czech Republic. And whatever Germany does to keep the lights on, the coal phase-out involves more green subsidies—some €40 billion to compensate utilities for prematurely closing coal-fired plants, the commission estimates. Mrs. Merkel’s government is expected to approve the commission’s plan. But her tenure as Chancellor will end long before coal-fired electricity does. Her successor will have an opportunity to call time on Mrs. Merkel’s green follies, and Germany’s beleaguered bill-payers should hope that he or she does. 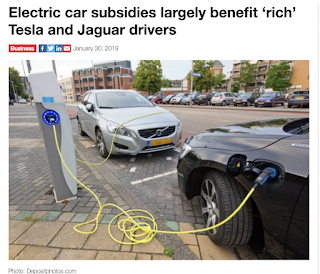 Around half of the Dutch government’s 700 million euros subsidies for electric cars has ended up in the hands of ‘rich Tesla and Jaguar drivers’, the Volkskrant said on Wednesday. Last year, the government said it would fund tax breaks totaling €700m for electric car drivers. 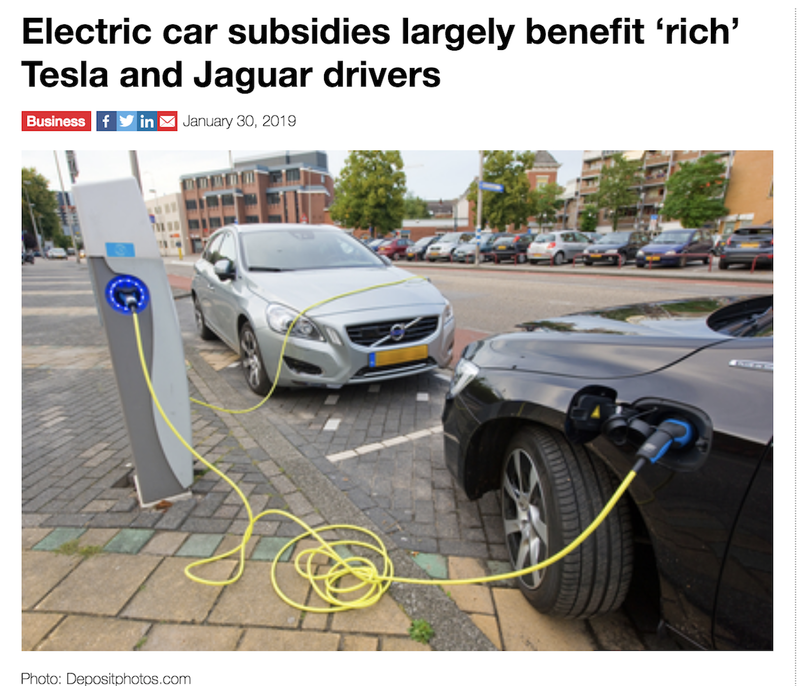 But almost half the 25,000 electric cars bought in the Netherlands in 2018 were Teslas and Jaguars with a price tag of €80,000 to €120,000, the paper said. In particular, the sale of Teslas rose 260% last year. The paper bases its claims on answers to MPs’ questions given by tax minister Menno Snel in parliament on Tuesday evening. 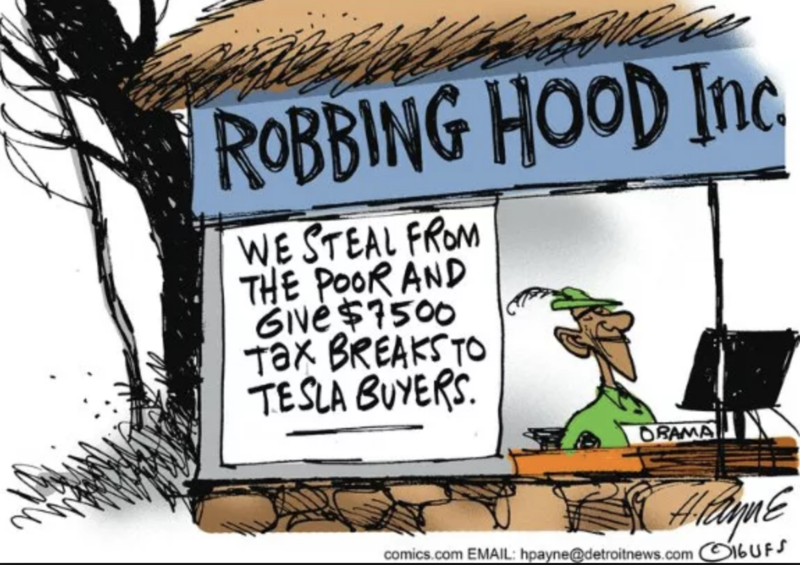 This means that CDA leader Sybrand Buma’s comments that ‘prosecco-drinking Tesla drivers’ have profited from the tax break at the ‘expense of the ordinary man in the street’ are largely true, the paper said. It points out that the subsidies for electric cars are mainly funded by higher taxes paid by petrol and diesel car owners. The government had assumed 11,000 electric cars would be bought in 2018, with an average price of €43,000. Instead, 25,000 were bought for an average of €63,000 each. This, the paper says, means the subsidy scheme has overrun its budget by ‘a couple of hundred million euros’. Record coffee output in Brazil drives down prices and piles pressure on farmers. Coffee growers in Guatemala have abandoned farms while Colombian farmers have turned to coca, which is processed into cocaine. 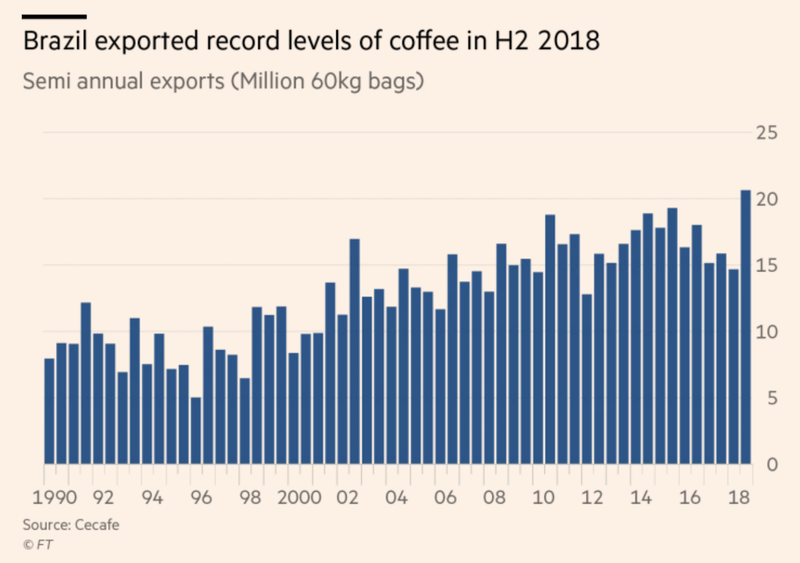 All eyes in the coffee market are on Brazil, as record production levels have knocked global prices to near 12-year lows. The country’s coffee growing has traditionally followed a cycle of biennial swings, with an “on” year of large production followed by an “off” year of low output as the trees recover. 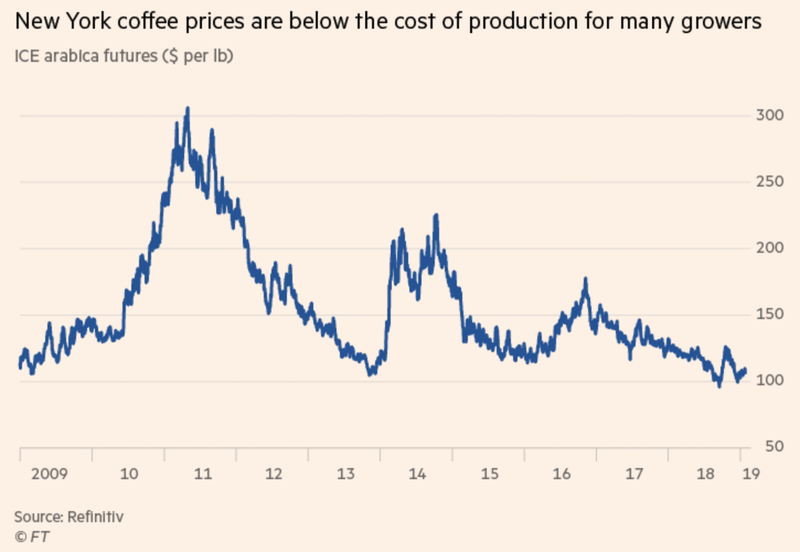 As such, there should be little respite for the world’s coffee farmers who have been struggling under low prices brought on by Brazilian output. The Latin American country is often described as “the Saudi Arabia of coffee” because of its influence on prices. 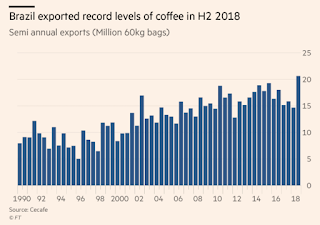 Brazil accounts for about a third of the world’s coffee output and has about a one-quarter share of the international export market. New York coffee prices, a benchmark for bean trading, have rebounded from recent lows but have fluctuated just below $1.10 a pound. That is below $1.20 to $1.50, the levels that many farmers in Latin American countries need to turn a profit. Coffee growers in Guatemala have abandoned farms while Colombian farmers have turned to coca, which is processed into cocaine. The London-based Global Warming Policy Forum is a world leading think tank on global warming policy issues. The GWPF newsletter is prepared by Director Dr Benny Peiser - for more information, please visit the website at www.thegwpf.com.